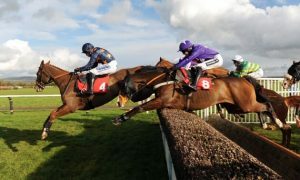 Joe Sheridan’s Springhill Stud hit form with a vengeance at Annaghmore last Sunday winning both the Free For All and the highest graded handicap on the day the 022/042 with Ayr Glory and Springhill Kate respectively. Ayr Glory (drawn 3) had been beaten back into third spot on his seasonal debut behind the invincible Crown Manhattan at Annaghmore a fortnight ago but with that rival safely out of the way (on a ferry to Tir Prince for the first COG heat) punters latched on to the former Scottish owned colt backing him in from 2/1 to 1/4 in the ring beforehand. Also supported in the betting beforehand were Earned Income (drawn 5 and driven by late switch to Alan Richardson) and Bon Jasper (drawn 1) while there was also some support for Southlands Art (drawn 6) with Flashdance (2) and Swingman (4) making up the numbers. At the off, Earned Income blasted from the 5 hole but Bon Jasper refused to surrender the coveted hub rail. Both drivers went kamikaze fractions to the quarter in 27.1 until Bon Jasper suddenly dived in the air and lost his momentum fractionally. He could have been jumping a shadow or else maybe that it was the stress of his first start in almost 2 years but his lapse of concentration had now given Earned Income the upper hand. Jasper settled back down in second spot despite with Richardson continually looking down anxiously for some signs of apparent injury and having the horses best interests at heart. Thankfully Jasper didn’t look any the worse for the incident but he never seemed to recover from there on in. This left Earned Income in charge with Ayr Glory stalking him and Southlands Art also poised to mop up any mistakes by the front two. At the half, the pace was still hectic and by the three quarter pole the race appeared at Earned Incomes mercy. Ayr Glory dug deep however and stayed on gamely to land the spoils from a fast finishing Flashdance and a luckless Earned Income. Ayr Glory seems to have matured a lot over the past season and has developed into a true FFA performer and not a mere pretender. There was a time when he could have been accused of staying in the trenches when the bugle sounded to charge but not anymore. He showed great courage and determination in his races at Annaghmore this season and Im sure he’ll pop up and win at least 1 heat in the COG series and maybe the Musselburgh Free For All if the invite drops onto the welcome mat any day soon. Of the others, Earned Income just ran out of petrol in the dying strides and retains plenty of ability in what is the twilight of a long and distinguished career. Flashdance has more of a name these days as a crack saddle performer but that doesn’t do this horse justice at all. He was charging late and fast and he nearly pulled off a shock victory and he would be an asset to any stable and a lively contender in this sphere. Swingman although game, is not in this class while Southlands Art had inconclusive blood tests earlier in the week and deserves another crack at a FFA. Bon Jasper was the most puzzling as reports were that he was working around Annghmore in 1.58 but the uncharacteristic dive into the air at the quarter pole would leave him with more questions than answers after Sunday. In the Class 022/042 handicap Springhill Kate came with a storming late challenge to land the spoils in 2 mins 01.6 secs from favourite Porterstown Thierry and US import Celebrity Tango. Kate filled the runner up spot at Musselburgh a couple of years back (when being handled by Mick Lord) and she has taken her time to reach the heights expected of her since then. Sundays easy win in a very respectable time will be a great confidence booster and Kate will win plenty this campaign after Sundays performance. Porterstown Thierry was a gallant runner-up having had his first start on a hard track for 3 years but he showed that he is equally at home on this surface and will win again before the season is out. Expensive US import Celebrity Tango has proved costly for punters to follow having broke in every one of her races this season, but having been uneasy on the opening turn in this contest and dropping back through the field, she mounted a comeback on the second circuit and showed a glimpse of what she could be capable of if managing to maintain her composure and her gait in races. Entered for the Derby at York this weekend, it wouldn’t be a surprise if she were to pop up at very rewarding odds in a heat or in time pick up a heat in a fillies division of a classic somewhere. One definitely to note, but maybe not one to plunge in confidence your hard-earned just yet! The Springhill Stud almost notched up a treble on the day when their representative in the Class 010/018 Porterstown Mystic was narrowly beaten by Bad Girl Hall and Wellfield Gary in 2 mins 03.5 secs. This was standard fare and a race of not much note. Tommy Beattie’s rapidly improving Ice Skater Hanover continued her recent run of good form with a bloodless victory in the Class 000/005 handicap. See My Refelection was favourite in this but could never land a blow on the winner in an electric time of 2 mins 00.8 secs. Having had a wind operation, shes on a serious upward curve and as Del Boy trotter says “the world is her lobster” at this present moment it time. Still low in the handicap, it will be a while before this ones colours are lowered in combat. Billy Roche’s latest acquisition Little Benjio made a winning debut in the afternoon’s Improver/Intermediates contest and landed a monster gamble in the process. Fought Hanover was gambled beforehand and that made a price for Little Benjio. The boys went in strong and we had a mouth-watering head-to-head on our hands. And so it proved to be when the gate pulled away when Billy and Alan Richardson (driver of Fought) went a suicide 27 opener with neither driver giving an inch. Finally Billy got a bit of sense and dropped in only for Alan to then drop anchor going to the half in a normal 61 for this grade. The Billy popped back out again and then they went at it hammer-and-tongs for the remainder of the race with Little Benjio eventually gaining the upper hand close home. What a thriller for all who were present to see it. Fought Hanover reported broke down leaving the track and it was a shame to see such a brave horse contract the injury having given his all in the event for his driver. Jealous Guy ran away with the Novice/Intermediate class in 2 mins 01.1 secs for owner Mike Patterson, foiling a gamble on Jasper Hill in the process. Patrick Kane’s Derby contender drew 1 in this, warranting the plunge, but Jealous Guy hit the front and set a strong pace. Jasper Hill settled back in second and looked to be stalking the leader until the three quarter pole when Jealous Guy kicked on again and Jasper Hill couldn’t go with him. Unfashionably home-bred (Blatently Bald/Newtown Sunray) Jealous Guy is a very decent up and coming performer and I’m sure will scalp a few more expensive yanks before the year is out. 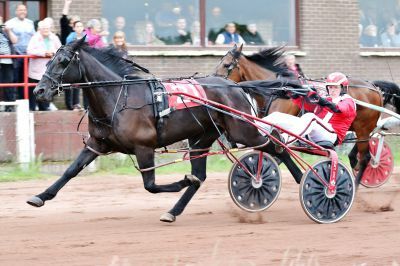 The square trot was a walk in the park for the Jimmy Stewart driven Quarterpast Six. His job was made a lot easier by the messing at the start of Colin Trot but when Colin trot settled he really gave chase hard without ever really getting there. The time was a very respectable 2 mins 02.8 secs and the winner is a very classy square goer. Two divisions of maidens were run on the day and these were won by Newtown Vanquish in 2 mins 05.9 secs and West Cork raider Meadowbranch Demon in 2 mins 04.7 secs respectively. The three year old Demon was mightily impressive in the latter maiden bearing in mind it was 16 lengths off the lead the at three quarter pole. The Mikey Kelleher owned and driven colt had broke at the start and was very green throughout the event before the penny finally dropped rounding the home turn. Being out of Churchill Queen (her of Meadowbranchs Gigolo and Frank fame) Demon is undoubtedly a juvenile of immense talent and will make a very smart horse in time. A qualifier was held before racing and Doonbeg, who was entered during the week and whom a lot of people came to see was a no-show. This was won by Meadowbranch Liath in 2.06 with a skewbald Colour me Irish finishing a close second and Meadowbranch Belle a rather unsettled third. This entry was posted in News on 2017-12-26 by admin.